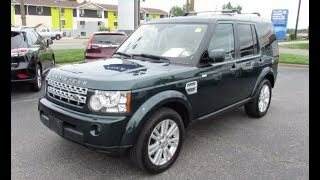 For the model year 2012, Land Rover Discovery 4 gets a new ZF 8HP70 8-speed automatic transmission that comes with rotary gear shift selector and paddle shift. The new Discovery 4 also receives power increase to 256PS with reduction in the CO2 footprint. If you not blown by the 256PS power output, the premium Harmon Kardon Logic 7 with 17 speakers and 825W of power will sure blow you away! New Features For 2012 Ensure The Discovery 4 Remains Crowned The World's Most Capable All-Purpose Vehicle. The outstanding 211PS 3.0 LR-TDV6 diesel remains the entry level choice for Discovery 4 customers in European markets conforming to EU5 emissions regulations. For 2012, the engine has been further improved with a reduction in CO2emissions from 244g/km to 224g/km thanks to a low-flow fuel injection system and a new, highly efficient, ZF 8HP70, 8-speed automatic transmission. This new 8-speed transmission benefits the high powered 3.0 LR-SDV6 with an increase in power output from 245PS to 256PS and helps drive down CO2emissions from 244g/km to 230g/km. In conjunction with the new transmission, the Discovery 4 is now equipped with the rotary gear shift selector and steering wheel-mounted paddle shift. All EU5 models are equipped with a diesel particulate filter (DPF), making them among the cleanest diesel engines on the market. In addition to the driveline improvements, the Discovery 4's design and equipment levels have been given a makeover too. There are two new alloy wheel designs, three new option packs and improved audio and navigation systems based on the latest MOST Gen 2.1 electrical architecture. The entry-level audio system has now been upgraded with a colour screen replacing the previous black and white unit and available with Bluetooth, DAB and USB/iPod connectivity. Also for the first time, the audio system is available with a non-navigation touch-screen. The new GEN 2.1 provides enhancements to the Premium Harmon Kardon LOGIC 7 system with an astonishing 825W of power through a 17-speaker system whilst the new 'Say What You See' voice command on premium systems allows the driver to use spoken shortcut commands. "Improved performance, lower CO2emissions and enhanced design and equipment levels, consolidate the Discovery 4's position as the most capable and versatile all-purpose vehicle on and off the road today. 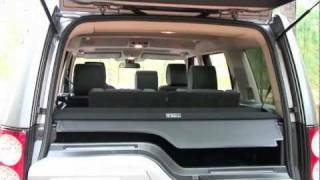 The Discovery 4 is quite simply in a class of its own,"said John Edwards, Land Rover Global Brand Director. 6-speed automatic transmission with command shift. All versions of the 3.0-litre diesel engine are equipped with the same parallel sequential turbocharging system. Throttle response is staggering with maximum torque available from only 2,000rpm. The new 3.0-litre diesel can significantly out perform its rivals by delivering 500Nm in only 500 milliseconds from idle.This means drivers have instantaneous access to 83 percent of maximum torque. When it was introduced at 2010 model year, the parallel sequential turbocharging system was the first of its kind to be fitted to a V-engine anywhere in the world. The twin turbochargers work sequentially to provide best in class torque at low speeds and pack a huge punch at high speeds. The 3.0-litre diesel set new standards of refinement and fuel economy at 2010 model year with its third generation common rail fuel injection system. Operating at 2,000bar, the piezo injectors are designed to minimise noise while optimising combustion. The system operates in 'metering mode' supplying just the right amount of fuel to the injectors rather than returning it to the tank and wasting pumping energy in the process. European market diesel models are now fitted with a DPF and have an advanced EGR system to reduce NOx. "The entry level version of the 3.0-litre engine ensures that Land Rover's latest diesel technology is available to a greater number of customers. Both versions combine stupendous low end torque with high power, efficiency and the impressive levels of refinement Discovery 4 owners have come to expect,"said Paul Walker, Chief Programme Engineer. The 8HP70 is packed with energy saving features. The hydraulic actuating system is more efficient too, the hydraulic pump drawing less energy from the engine. The torque converter is calibrated to lock-up at lower speeds and operating temperature, reducing fuel consumption and once again taking advantage of the 3.0-litre diesel engine's immense low-end torque. Transmission Idle Control seamlessly and transparently selects neutral when the car is stationary and the engine idling in drive, reducing drag on the engine and saving fuel. The 8HP70 has brains too. In hot conditions it selects a lower gear to run the engine and air conditioning pumps faster to cool down the cabin quickly. In cold conditions it runs the engine faster to reduce warm-up time and emissions. The astonishing 5.0 LR-V8 naturally aspirated engine, designed specifically with Land Rover vehicles in mind, remains in the Discovery 4 line-up unchanged for the 2012 model year. The lightweight aluminium alloy engine is both super-efficient and compliant with the stringent US ULEV2 and European EU5 emissions regulations. The 5.0 LR-V8 produces 375PS and 510Nm torque with low CO2emissions of 328g/km. One of the secrets of the V8's efficiency is the centrally-mounted, multi-hole, spray-guided fuel injection system delivering fuel at a pressure of up to 2175psi (150bar) directly to each cylinder. The injectors are positioned to deliver fuel precisely to the centre of the combustion chamber for maximum air-fuel mixing and accurate combustion control. The charge cooling effects of the direct injection system allow a high compression ratio of 11.5:1 which further improves engine efficiency. During the engine warm-up phase, the combustion system employs multiple injection mode strategies to deliver 50 percent more heat for fast catalyst warm-up and substantially reduced emissions. A number of clever design features include the industry-first, torque-actuated variable camshaft timing on all four cams. Unlike conventional systems which rely on oil pressure, these are actuated by the positive and negative torques generated by the opening and closing of the valves, reducing energy consumption.Camprofile switching (CPS) selects either a profile suitable for low speed running or another which gives increased lift for high performance. This provides the Discovery 4 with exceptional low-end torque to negotiate demanding terrain and allows it to become fleet of foot when conditions allow. "The LR-V8 engine continues to justify its position as one of the finest engines in its class having set new standards for efficiency, power and torque that remain hard to beat. The combination of advanced technology and light weight make it the ideal power unit, complementing the Discovery 4's off-road and on-road capability,"said Murray Dietsch, Director of Land Rover Programmes. The LR-V8 drives through the ultra-refined ZF HP28 6-speed automatic transmission. Its characteristics have been optimized by Land Rover engineers to provide the same class-leading response, with rapid and refined shifts. The superior power and torque characteristics of the engine make it possible to actuate the transmission's lock-up clutches much earlier in each gear, reducing slip through the hydraulic torque converter, optimizing both fuel consumption and CO2emissions. The Discovery 4 suspension system was substantially revised for 2010 model year with changes to roll centres, anti roll bars, suspension knuckles, damper bushes and the addition of a variable ratio steering rack for greater stability during high speed cruising and increased sensitivity at acute steering angles. More powerful brakes comprised twin-piston sliding callipers with 360mm ventilated discs at the front and single piston with 350mm ventilated discs at the rear. The understeer control system, which intervenes by automatically slowing the vehicle to bring it back under driver control, was also revised. These features remain unchanged in 2012 for all versions of the Discovery 4.
with its acclaimed Terrain ResponseTMsystem. For 2011, two additional functions were added, Hill Start Assist and Gradient Acceleration Control. Hill Start Assistretains the initial driver-generated brake pressure long enough for the foot to move from brake pedal to throttle without the car rolling backwards. The brake is released after a sufficient time has elapsed or when the engine is supplying enough torque to move the car up the hill. Hill Start Assist is always available, not selectable, and neither is its operation indicated to the driver. Gradient Acceleration Controlis designed to provide safety cover on severe gradients when the driver does not have Hill Descent Control engaged. By pressurising the brake system, Gradient Acceleration Control slows the car to a limit determined by the throttle position when the car is descending the slope in the driver's intended direction of travel. This includes descending the slope forwards in drive, or rearwards in reverse. Otherwise (such as descending while facing up the gradient with Drive selected) Gradient Acceleration Control restricts speed to 5km/h (3.1mph) for up to 20 seconds, allowing the driver to regain proper control. "These advanced all-terrain functions have proven themselves to be world class since their introduction last year. Both are subtle but effective additions which deliver an added layer of safety to drives who want to venture further afield,"said Nick Veale, Vehicle Engineering Manager. Three new option packs are available to customers for 2012 - the Technology Pack, HSE Luxury Pack and the Vision Assist Pack. The Technology Pack includes Premium Navigation incorporating 4x4i off-road navigation, as well as 'Say What You See' voice activation and Parking Aids for the front and rear with rear view cameras. The HSE Luxury Pack includes Xenon Adaptive Front Headlamps including Cornering Lamps, Harman Kardon LOGIC7® 17-speaker 825W audio system, Premium Leather Pack, full-length roof rails in satin black, electric steering column adjustment for height and reach and an electric tilt/slide sunroof and the front centre console holds a cooler box. For 2012, crisp new steering column stalks with chrome bezels provide clearer symbols and a new premium pebble-like design to the smart key makes it both more attractive and easier to carry. Externally a new 19" alloy wheel comes as standard on the HSE whilst a Gloss Black 20" 5 split-spoke wheel design and extended Satin Black roof rails are available as customer options across the range. The Timed Climate feature which pre-heats the cabin and engine in cold weather, has been upgraded from a one-day timer to a seven-day timer operated much like a home central heating programmer. Programming is accomplished via the audio system touch screen or remote control. Where touch screen audio systems are not fitted the feature is controlled with the remote control only. 8-speaker system with colour display replaces the previous system with black and white display. The entry level system also has options for Bluetooth, DAB and USB/iPod connectivity. The Hi-ICE Harman Kardon System has been upgraded from 9-speakers to 11-speakers and the output boosted from 240W to a substantial 380W. The Premium Harman Kardon LOGIC 7 system has seen the most dramatic improvement, from 14 to 17 speakers and an almost unbelievable increase in output power from 480W to a staggering 825W. The higher end touch-screen audio systems were previously available only in conjunction with a navigation system but are now available independently. Navigation is available in two levels - Base and Premium, with the latter enhanced with voice activation. Touch screens have been revised with a new, contemporary style and a 'Virtual CD Autochanger' on models equipped with hard-disc navigation allows storage of up to 10 albums in uncompressed format on the same hard drive. 'Say What You See' voice activation gets over the problem of memorising commands and prompts the driver by displaying commands in a step-by-step format on the screen. Voice commands can be run together as shortcuts and the system is activated by the Push-to-Talk (PTT) button on the steering wheel. Rear Seat Entertainment (RSE) is now equipped with a single slot DVD drive in the audio head unit so the disc can be conveniently loaded from inside the cabin. This new system replaces the previous six DVD Changer accessed through the luggage compartment. The rear seat audio system is operated by new powerful wireless technology called WhiteFireTMvia cordless headphones, and can also be controlled by remote control. The system supports connectivity with games consoles and video playback of MP4 files stored on USB. The phonebook capacity for the Discovery 4 has increased significantly for 2012 from 700 entries to several thousand, whilst the TFT Message Centre interface has been redesigned to display audio, phone and navigational information. Returning home is just that little bit easier for owners with remote opening gates or garage doors. The Homelink option is packaged with High Beam Assist and can learn the frequencies of most transmitters used to operate automated garage doors and gates. The press of a button is all it takes to operate. The new Discovery 4 is packed with features aimed at reducing fuel consumption and reducing CO2emissions. Both the 245PS and 211PS versions of the LR-TDV6 3.0 Sequential Turbo Diesel engine are designed to deliver class-leading fuel economy and improved low-end torque. The LR-V8's high pressure, spray guided direct injection system optimises combustion while the variable camshaft timing system, camshaft profile switching and variable inlet manifold all join forces to ensure the engine is optimised for fuel efficiency throughout the range. Thanks to the advanced cooling system, faster warm-up also improves fuel economy as do the low friction design features. Engines have also been optimised for low-end torque as well as economy, making it possible to activate the lock-up clutch of the automatic transmissions at lower speed. This reduces 'slip' in the hydraulic torque converter improving both fuel consumption and CO2emissions. The higher torque at lower rpm also enables longer gearing for more economical cruising. The Discovery incorporates several other energy saving features too. At standstill, the idle speed of the 3.0 LR-TDV6 is a low 710rpm and the LR-V8, 700rpm, using the minimum of fuel without compromising refinement. An Intelligent Power Management System includes Smart Regenerative Charging, so whenever possible the alternator charges the battery when it is most economical to do so, such as when the car is coasting rather than accelerating. Aerodynamic features at the front end such as the lower chin spoiler and front wheel deflectors help to reduce drag by increasing underfloor airflow. The air conditioning pump is driven through a clutch which disengages when the air conditioning is not in use, reducing parasitic losses and delivering improvements in fuel consumption and CO2emissions.